Animosity, bloodshed and war will soon end! The world will finally enjoy peace — through true love. Love! Peace! The flower children of the 1960s shouted these lofty words everywhere. They felt the hatred — witnessed the injustice — abhorred the bloodshed. They protested against the evils — they sang and even cried about something better. But love and peace never came. The days of the flower children are long gone, but the need for world peace remains. Incredibly, sadly, the world, as you read this, is on the very brink of destroying itself! Yes, what the world needs now is love, but not the ineffectual love of the flower children, nor any other love of this world. We need the effectual love of God to change this world. And God's true love will finally produce peace on earth — and soon. Read on and discover how peace, through love, will spread all over this world. Hatred destroys peace. But what causes people to hate one another? When did animosity first rear its ugly head? Let's go back to the beginning and see. In the Garden of Eden grew two trees: the tree of life and the tree of the knowledge of good and evil (Genesis 2:9). These two important trees represented two ways of life. The tree of life represented the way of giving, the way of God's love, the way that will permeate the wonderful world tomorrow. And what is God's love? "For this is the love of God, that we keep His commandments. And His commandments are not burdensome" (I John 5:3). Jesus Christ tells us that God's love has two main aspects. Listen as Jesus paints the beautiful picture: "You shall love the Lord your God with all your heart, with all your soul, and with all your mind. This is the first and great commandment. And the second is like it: You shall love your neighbor as yourself' (Matthew 22:37-39). Jesus made it vividly clear that what Adam could have gained from the tree of life covered two important areas, just as God's law is divided into two branches. The first four commandments of the Ten Commandments teach us how to love God. The last six show us how to love our fellow man — how to produce peace through love. The life of God's tree of love is the water or sap that flows through its branches. Jesus Christ compared the Holy Spirit to flowing water (John 7:38-39). The Holy Spirit flows through the tree of life producing fruit. And what are the fruits of that tree? Are they animosity, bitterness and hatred? No! "But the fruit of the Spirit is love, joy, peace" (Galatians 5:22). But unfortunately, Adam, and all of humanity with him, rejected the tree of love and the fruit of peace. Adam chose the tree of the knowledge of good and evil, the get tree, the tree of enmity — the tree that produced the terrible world today. Satan's tree also has two main aspects — enmity toward God and enmity toward fellowman. Satan's spirit is the sap of his tree. The rotten fruits of this tree fall out all over this world: hatred, dissension, wrath and bloodshed (Galatians 5:19-21). When he ate the fruit of the wrong tree, Adam's mind became saturated with the adversary's attitude of competition and strife. After all, you are what you eat! The human mind absorbs Satan's carnal attitude toward God and neighbor, and humanity has known nothing but hatred and death ever since. As Romans 8:6 says, "For to be carnally minded is death, but to be spiritually minded is life and peace." Why can't man find peace? "Because the carnal mind is enmity against God; for it is not subject to the law of God, nor indeed can be" (verse 7). Man's very nature hates God's tree of love — the tree that leads to peace through love. When will there be peace? When the prince of enmity is dethroned and the Prince of peace is enthroned. When man stops eating of the tree of enmity and starts eating of the tree of love. Then peace shall reign! And that is exactly what will happen — in the immediate future. Yes, the Prince of peace shall come! The angels shall shout: "The kingdoms of this world have become the kingdoms of our Lord and of His Christ, and He shall reign forever and ever!" (Revelation 11:15). Then Jesus Christ will remove Satan from his throne as god of this world (II Corinthians 4:4). Satan will be bound, unable to broadcast his spirit of enmity (Revelation 20:1-3). Satan's tree of enmity will wither and die — its fruit will disappear. Then Jesus Christ will set His hand to bring peace to this world. He will force the nations to "beat their swords into plowshares, and their spears into pruning hooks; nation shall not lift up sword against nation, neither shall they learn war anymore" (Isaiah 2:4). They will learn the way of peace and, believe it or not, you can help teach them. Then will be "the times of restoration of all things" (Acts 3:21). Jesus Christ will open the way to the tree of life — the way of peace — to everyone (Revelation 22:2, 14). God's Spirit of love will be poured out all over this earth (Joel 2:28). Love and peace will be everywhere, because the love of God will be poured out in the hearts of people by the Holy Spirit (Romans 5:5). The world will be ready to learn and live the way of peace. Nations will be ready to eat of the tree of life. Love and peace will no longer be empty words. Almighty God will fill them with substance — with action. For peace will never come by words alone, but by every act of love. God will teach people how to love one another through His law. In the Kingdom of God, world leaders will be eager to heed. They will say: "Come, and let us go up to the mountain of the Lord, to the house of the God of Jacob; He will teach us His ways, and we shall walk in His paths. For out of Zion the law shall go forth, and the word of the Lord from Jerusalem" (Micah 4:2). And you can be there with Jesus Christ teaching the nations (Isaiah 30:20-21)! God is giving you an opportunity now to learn and live the way to peace. Jesus said, "Blessed are the peacemakers, for they shall be called sons of God" (Matthew 5:9). Let there be peace on earth, and let it begin with you! You must live it before you can teach it. So where do you begin? The way to peace is through God's law of love. In the world tomorrow you will teach people how to love their neighbors through obeying God's law. The first law that brings peace between people through love is the Fifth Commandment, which tells us to honor our parents (Exodus 20:12). Today parents and children are further apart than ever before, and we are further from world peace than ever before. Parents raise dictators and warmongers. Children grow up dishonoring and disobeying all authority, even God's. The result is crime and international terrorism. Children become the leaders who plunge the world into war. In the world tomorrow, you will teach parents how to teach their children. Children will honor and obey their parents. These children will grow up to be peace loving leaders. And you must be practicing that way of peace in your own family, and through teaching your own children, now. Now notice the Sixth Commandment: "You shall not murder" (verse 13). It doesn't take much imagination to see how this law of love will bring peace. Without murder, war is virtually impossible. But more than that, you will teach people to love to the degree of self-sacrifice. "Greater love has no one than this, than to lay down one's life for his friends," said Jesus (John 15:13). The Seventh Commandment reads, "You shall not commit adultery" (Exodus 20:14). Again God emphasizes the family as the way to peace. Adultery has shattered the peace of numerous marriages, ending in violence and divorce. In the world tomorrow, husbands and wives will remain faithful to one another. They will love each other so much that adultery will be unthinkable. Families will reap the peace of this law. Are you practicing this law in your own life now? "You shall not steal," reads the Eighth Commandment (verse 15). How many times has peace been stolen by the breaking of this law? One nation tries to steal (get) the possessions of another, and war ensues. Once you help teach people to give rather than get, stealing will be eradicated. Once stealing is eradicated, peace will be given to the world. Notice the Ninth Commandment: "You shall not bear false witness against your neighbor" (verse 16). Imagine a world where people kept their word — a world free of accusations and propaganda. Well, that's the kind of peaceful world you will help create through teaching and enforcing this law. "You shall not covet... anything that is your neighbor's," says the Tenth Commandment (verse 17). This is the law to end all wars. James asked, "Where do wars and fights come from among you?" The answer? "Do they not come from your desires for pleasure that war in your members?" (James 4:1). The desire to get is at the root of all sin. You will teach the nations to enjoy what God has given them and not lust after what God has given their neighbors. They will learn to praise God for His bountiful blessings — to rejoice with their neighbors rather than covet. 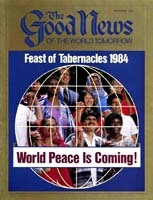 The whole world will rejoice in thanksgiving to God. God's law of love will form the foundation of world peace, which will be perfected through oneness. God's love goes beyond being "your brother's keeper." God wants you and all humanity to say, "I am my brother." Once we reach that pinnacle of love, world peace will be perfected. Jesus Christ explained the I-am-my-brother concept of love when He said, "You shall love your neighbor as yourself' (Matthew 22:39). You must love your brother as if you were loving yourself. The apostle Paul further explained the principle of peace through oneness when he wrote, of Jesus: "For He Himself is our peace, who has made both one, and has broken down the middle wall of division between us... that He might reconcile them both to God in one body through the cross, thereby putting to death the enmity" (Ephesians 2:14, 16). Jesus Christ makes us one in Himself. He frees us from the way of competition and strife. He gives us the opportunity to love our brother as ourselves. We must crucify selfish concerns and motivations and let Jesus Christ live His life in us (Galatians 2:20). Then we must give to our fellowman as one in Christ (Galatians 3:26-29). But what makes us brothers — one family? In the human family the life force of the blood makes us one. In God's Family there is something thicker than blood. What is this tie that binds? Notice I Corinthians 12:13: "For by one Spirit we were all baptized into one body — whether Jews or Greeks, whether slaves or free — and have all been made to drink into one Spirit" (I Corinthians 12:13). We share the kindred Spirit of God flowing through our minds and character. Through this same Spirit of love and oneness, the nations of the world will find peace. There will be one Lord and one religion. "All the ends of the world shall remember and turn to the Lord, and all the families of the nations shall worship before You" (Psalm 22:27). God will even give the nations one language (Zephaniah 3:9). God's Holy Spirit will bind the nations together in universal love and peace. All the nations will be one world under God — indivisible. Love is not just what you say, it's what you do. Words of love must be backed up with acts of love (I John 3:18). In the world tomorrow you will teach the nations to become one with their brothers. Here are three action verbs beginning with the letter A that will bring about world unity and peace. The first A is accept. For people to live in oneness and peace they must accept one another. Many people refuse to accept others because they are different. Love requires complete acceptance of others. We accept our brother through God: "If someone says, 'I love God,' and hates his brother, he is a liar; for he who does not love his brother whom he has seen, how can he love God whom he has not seen? And this commandment we have from Him: that he who loves God must love his brother also" (I John 4:20-21). It's easy to accept your brother when you realize how much you have in common. We are all made in the image of God. We all have the same potential: to become part of the God Family. We all have hopes and dreams, sorrows and despair. Of course, even though we have many things in common, we still have differences. This brings us to the second A of peace: admire. God created variety — different cultures, personalities and talents in people. This is good. As the French say, "Vive la différence." In the present world Satan uses these differences to cause hatred and prejudice. If someone is not like us, we assume they are inferior. We then avoid them. But God's way is to admire the differences in the human family. The differences are an expression of God Himself. God has many marvelous attributes and talents. As a God of love, He spread them among all the nations. Paul instructed, "Let nothing be done through selfish ambition or conceit, but in lowliness of mind let each esteem others better than himself" (Philippians 2:3). In the world tomorrow each nation will admire the God-given talents of the others. No nation will look down on others. This admiration will lead to respect, and respect to peace. The third A of peace is administer. Administer means "to minister or serve." Service is the proof of love and the capstone of peace. Once people accept and admire one another, then they can serve one another in peace. Serving takes your mind off yourself and makes you think about the welfare of others. When you give, happiness and peace prevail. Jesus said, "It is more blessed to give than to receive" (Acts 20:35). Imagine all the nations of the world helping and serving one another — what a wonderful world it will be! Yes, oneness through the three As of love will perfect peace among the nations. Practice these three characteristics today. Soon now, you will teach them to the entire world. Almost 6,000 years ago Adam rejected the tree of life — God's peace tree. In a few years from now, humanity will be given another opportunity to partake of this tree. This time people will accept God's way. This time you, with Jesus Christ, will be there to help show the way. Man will learn to love his fellowman through God's law. Men will not be mere blood brothers, but spirit brothers — one forever. They will accept one another, admire one another and administer or serve with one another. World peace will come through love. Let us live the way of peace now, and when Jesus Christ returns let us spread it all over the world!